Ban Chiang National Museum houses the archaeological finds from the Ban Chiang area, which has been designated as a UNESCO World Heritage site. 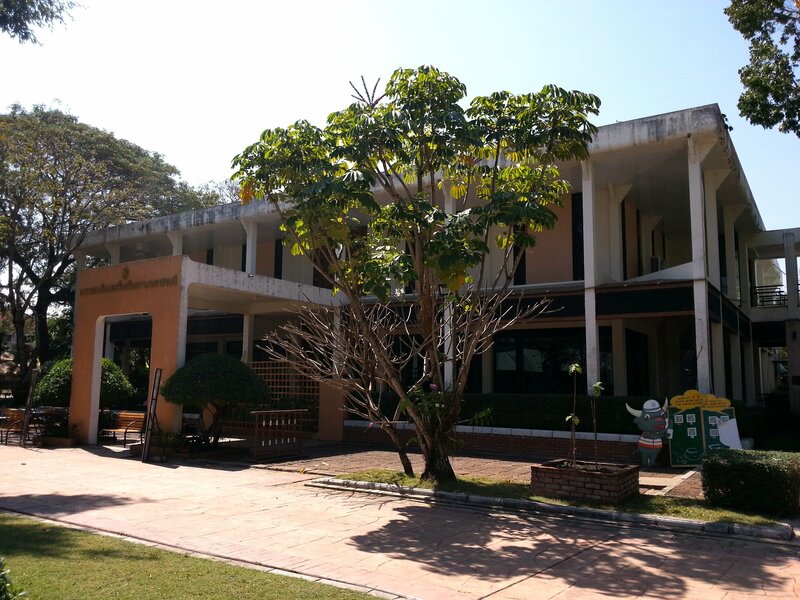 Ban Chiang Museum is open daily from 08:30 until 16:30 and the admission fee for foreign visitors is 150 THB. Ban Chiang National Museum does not receive any many foreign visitors as the importance of the artefacts displayed there merits because of its location 50 km away from the regional transport hub of Udon Thani. Most visitors who do go to Ban Chiang do so as part of a tour group or after paying a relatively expensive fare of 1,500 THB to 2,000 THB for a taxi to take them on the 100 km round trip from Udon Thani to the village of Ban Chiang, where the museum is located, and back again. You can, however, do the return trip for 250 THB if you have just a little patience and initiative. The cheap way to get from Udon Thani to Ban Chiang is to go to Udon Thani Bus Terminal 1 and take a bus to the village of Nong Mek, which costs from 25 THB one way. Nong Mek is a small settlement on the main road which runs from Udon Thani to Sakon Nakhon. If you tell the driver you want to go Nong Mek, and then Ban Chiang, you will be dropped on this main road near to the traffic lights at the intersection to the road through Nong Mek Village. If you go up the road at the intersection you will find tuk-tuks waiting there. The going rate for 7 km journey from Nong Mek to Ban Chiang is 100 THB. For the return journey you simply do the same journey in reverse although you may have to wait a while to get a tuk-tuk back to Nong Mek. 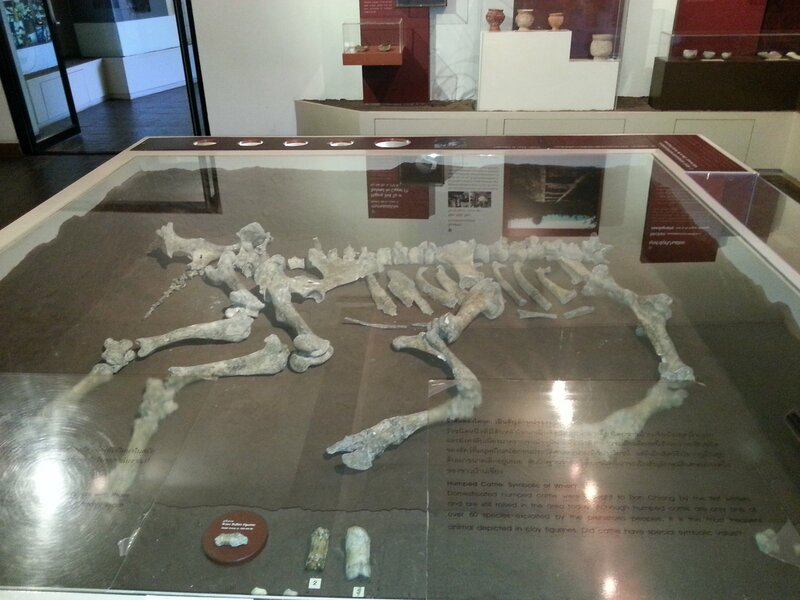 Ban Chiang Museum contains artefacts mostly dug up in the late 1960s and 1970s in the area around Ban Chiang Village. The importance of the often only partly buried relics was first recognised by an American academic in 1966 doing anthropology research with the current inhabitants of Ban Chiang. What the researcher discovered was the oldest, and most important, evidence of a settled agrarian community in South East Asia dating back around 1,500 BC. What makes the find at Ban Chiang so important is that they disproved the prevailing theory of the time that early civilisations in South East Asia had not developed technological skills, like making irons, or started using relatively modern farming techniques until a much later time. The thinking, prior to the discovery of Ban Chiang, had been that people in South East Asia lived very primitive existences until people emigrated from other areas such as Indonesia, China and India bringing new technologies and farming methods with them. 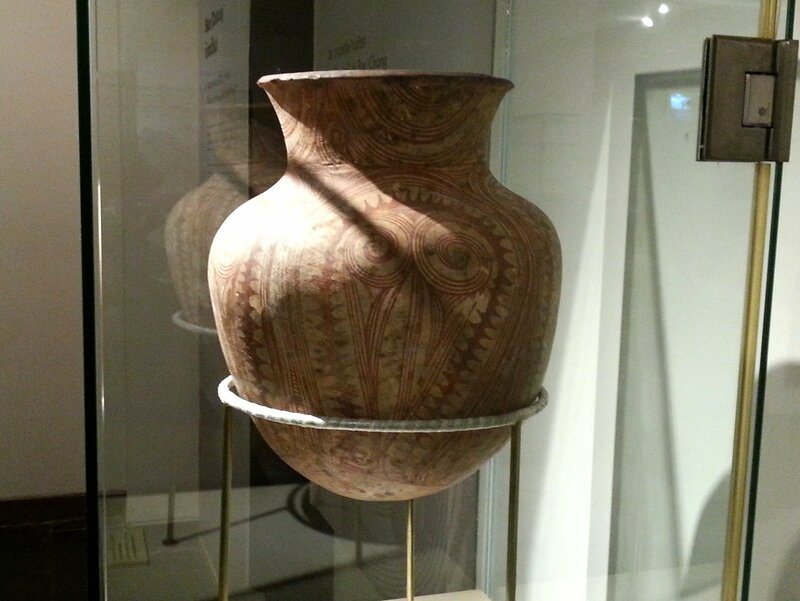 The oldest, and most famous, of the artefacts on display at Ban Chiang Museum is pottery. 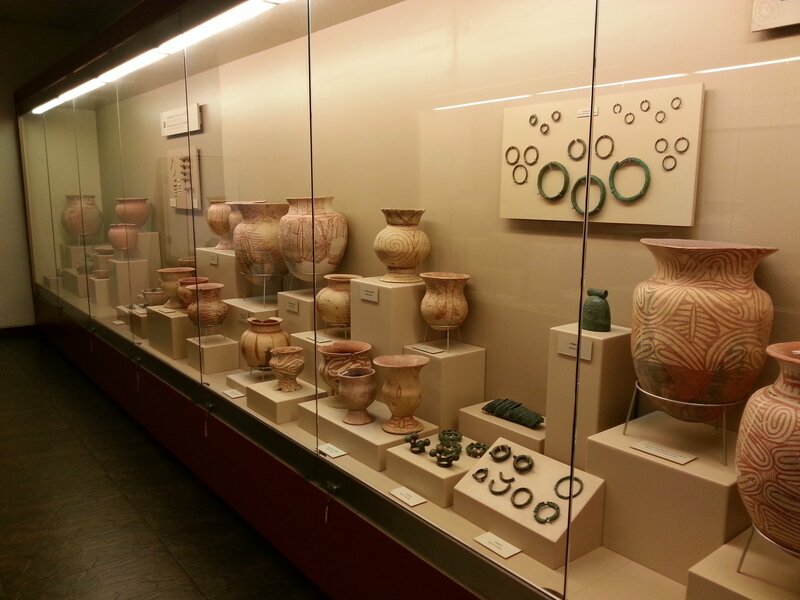 Around 200 intact ceramic pieces were discovered, along with a lot of pottery fragments. Many of the large jars had very elaborate patterns painted on them and archaeologists discovered evidence that the pots were used in burial ceremonies as well as for domestic purposes. 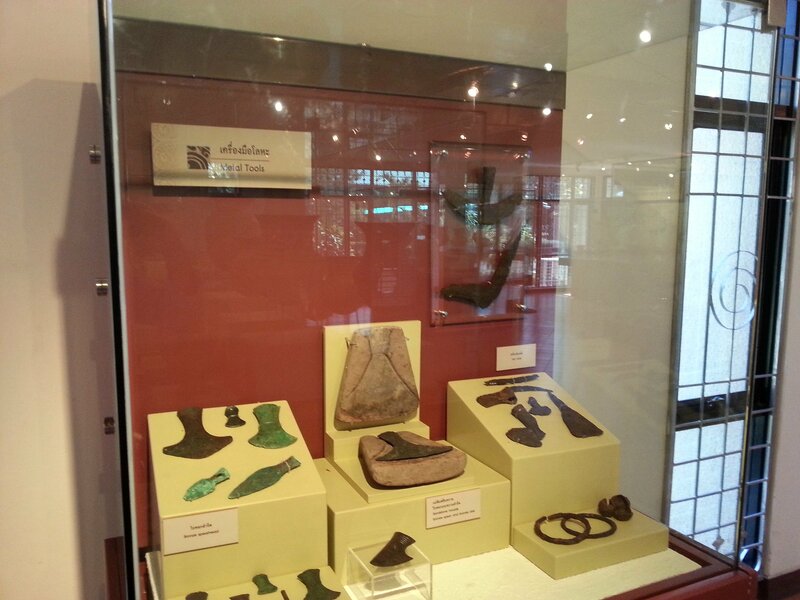 The other very significant finds displayed in Ban Chiang Museum are metal tools which were found in the surrounding area. Modern scientific methods have dated the earliest bronze tools found at Ban Chiang as dating back to around 1,000 BC and the earliest iron tools dating back to around 500 BC, both of which pre-date the mass migrations from neighbouring areas whose peoples had previously been believed to have brought bronze and iron making technologies with them to Thailand. 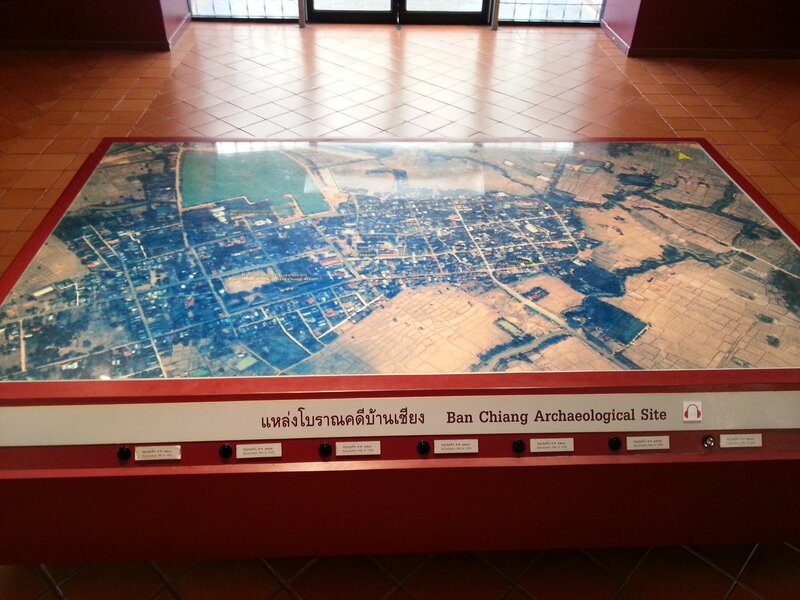 As well as artefacts, Ban Chiang Museum has lots of displays explaining the history of the archaeological sites and the lifestyle of those people who lived in these ancient villages. After the rooms displaying the artefacts you come to two rooms with very old-fashioned museum dioramas with well written information boards in Thai and in English. 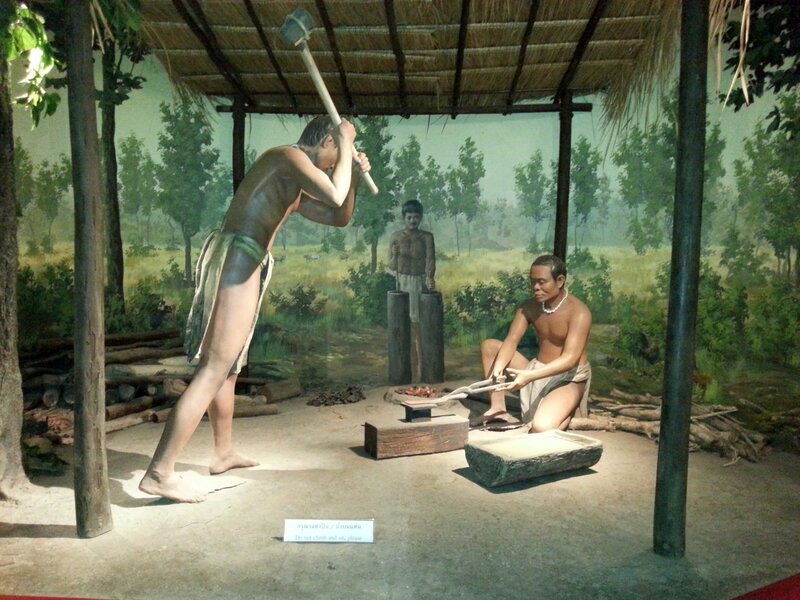 The first diorama room shows scenes from life in the Ban Chiang settlement thousands of years ago. The dioramas bring to life the inanimate objects display in other rooms, which are in themselves fairly meaningless without being put into context. 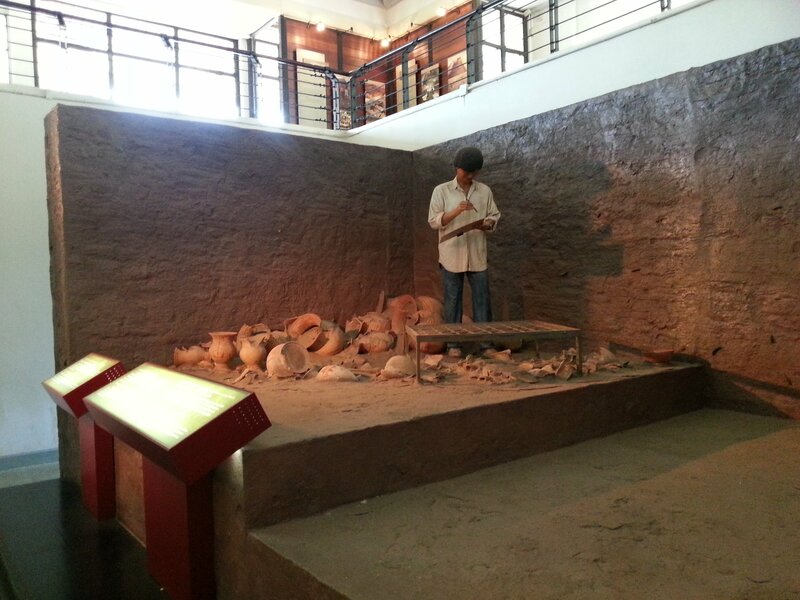 The second diorama room at Ban Chiang Museum focuses on the history of the archaeological excavations. Thai and International archaeologists have worked on the project over the years making the Ban Chiang National Museum very much an international project, as well as a project of international importance. Something to remember is that Ban Chiang National Museum is only the place where the archaeological finds are displayed and a establishment with an educational mission. You can also visit some of the sites where the finds were made, the most interesting of which is Wat Pho Si Nai, which is an 850 metre walk to the east of the museum. Wat Pho Si Nai has an open air museum display in the temple grounds with some skeletons and pieces of pottery which have left partly buried. This is an interesting exhibit which shows how the artefacts were found and what the archaeologists would have seen when they were first discovered. 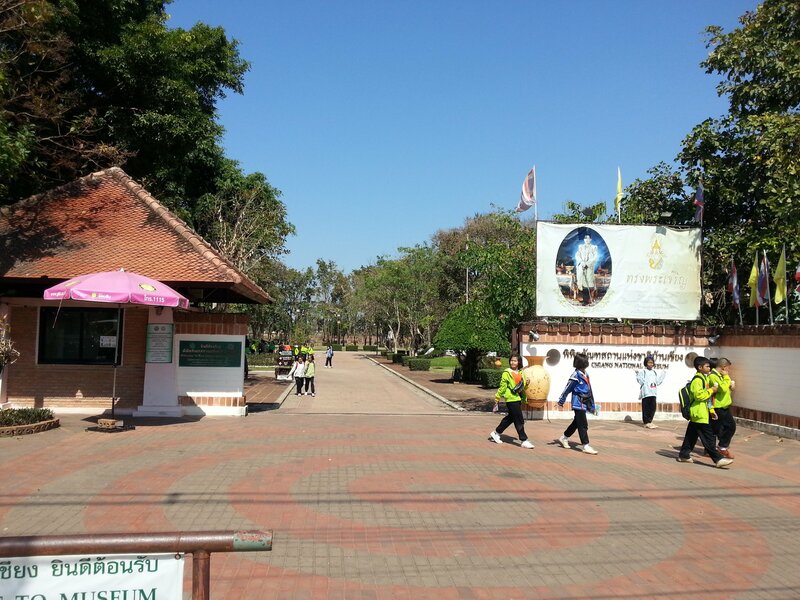 Ban Chiang Museum is located 50.7 km from Udon Thani Railway Station.